In 2014, Apple CEO Tim Cook proudly announced that over 130 million people joined the ranks of iOS users that year. This figure is primarily made up of iPhone users, which accounts for nearly 25% of the population in the United States, according to the NPD Group. You can think of this as 25% of the people in your city or town, or a quarter of your potential customers. And without an Apple app, you’re not reaching those customers. But maybe you want to join the mobile revolution and create an app for your business, but you just don’t know how. Well if that’s the case, Como’s got your back! Want to enable customers to easily make orders, reservations, locate your business, and read reviews? Want to lure customers with holiday coupons, a loyalty card, and enticing push notifications that appear directly on their iPhones or iPads? 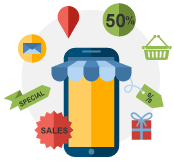 Want to increase sales by letting your mobile customers purchase your products instantly, at any time of the day, without having to step foot in your store? If you do, then it sounds like it’s time you considered creating an Apple app. And if you create your app with Como, you’ll reach customers on iPhone, iPad, and Android too because your app is compatible with both Apple & Android devices. Read about the benefits of having an Android-compatible app. Wait, isn’t building an app hard? You probably think that building an app is hard. And the truth is, it was. Years ago, building an app on your own was pretty much impossible to do if you weren’t a talented developer with brilliant design skills, but today you can do it on your own in a snap. Como’s do-it-yourself (DIY) platform lets you create your app in minutes using content from your existing Facebook page or website, or you can make it from scratch. So if you have a Facebook page or a website, type it in and start building your app. To get started, watch our video tutorials on how to start creating your app. Once you’ve created your app, the real fun begins. You can pick and choose designs, add and customize over 25 awesome features like coupons, a loyalty card, a mobile store, social media (Facebook, Twitter, and Instagram), menus, user reviews, and more. After you’ve put the finishing touches on your gorgeous app, it’s time to send it to the Apple App Store. And we’re happy to help you with that too! From the instant you click “Create My App,” our customer success team is ready to walk you through every step of the process. In addition to the FAQs, articles, tutorials, and videos you’ll find on site, there’s an entire team ready to answer all your questions. You can also get in touch with Como through Facebook, Twitter, and our blog. Visit the blog to get great tips on how to use your app to boost sales, connect with customers, and keep customers coming back. Still not sure you need an Apple app? Mobile commerce is on the rise, making up more than $58 billion in 2014. And remember that a huge chunk of that came from iPhone users—over 79 million people in the United States. Obviously, having an Apple app won’t mean that you’ll be automatically in the pockets and minds of millions of users, but it does give you the opportunity to stay connected with and keep tabs on your customers and potential customers in your local community who have iPhones. 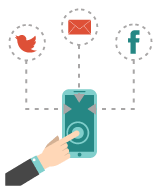 You can tell those customers about upcoming sales through push notifications, engage them through social media, or simply remind them that they can shop not only at your store in town, but they can shop directly through their phones at home or wherever they may be. Now that sounds like a pretty good reason to have an Apple app.